I didn’t do a big cooking project this weekend, but I have decided to try to get back to a regular publishing schedule. So I will aim to post every Monday, regardless of how intensive my cooking efforts have been, and to post more if I can manage it. This isn’t to say that I have not done any cooking. I’ve made a few pasta dishes, and froze some pesto for the winter. (I haven’t actually done that before, but I understand one is supposed to omit the parmesan before freezing because the consistency doesn’t work out so well upon thawing. I’ll report how that worked when the time comes.) The night of my canning I made a basic pasta-tomato-basil dish to accompany sauteed chicken breast, but I didn’t photograph it. I’ve been out of the habit of photographing if it’s not a special recipe. I may have to rethink this so I can show off a few nifty-looking but not difficult dishes. 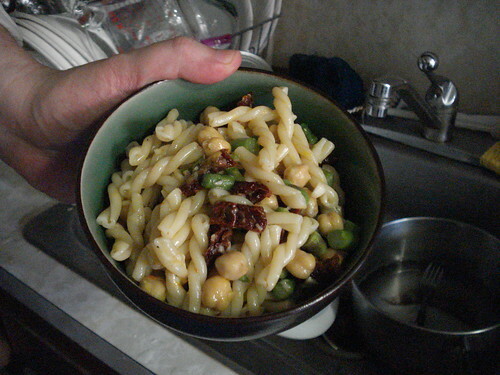 I boiled pasta and combined it with sun-dried tomatoes, garlic, olive oil, chickpeas, lemon zest, salt and pepper, parmesan, and asparagus. I tossed the asparagus bits into the pasta water a few minutes before the end of the boiling and drained it all together. That’s typical of a lot of the cooking I do: I like to improvise. Or sometimes I have little choice but to improvise, if the hour is late and my foot is sore (that flipping plantar fasciitis) and I can’t find it in me to make a run to the store. I could just sigh and lament the long-lost days of living above a Zupan’s, or spend even more of our disposable income on delivery, but far better to rummage the shelves and figure out a clever combination. A recent Techlicious article spotlights several sites that help you do this kind of improvisation more easily. I’ve signed up for SuperCook.com, which lets you store pantry items and add other ingredients on hand to see what you might be able to throw together. I’ve populated most of my staples, and before adding anything from the fridge or freezer I was already seeing a lot of pasta and garlic dishes; adding mint and lemon significantly expanded the options. Unsurprisingly, I seem to be able to make just about any kind of cake or cookie if I’m so inclined. Though as it happens, I have not been willing to turn on the oven. We’ve had a hot summer. Yesterday was the first relatively cool day in weeks, as my electric bill can attest, and if we had stayed home I’d have thought about making chili and maybe baking a batch of cookies. But instead we went out to a tavern where our neighbor works; at his insistence we tried the fried dill pickles, and now I am going to have to make some for myself. But not tonight. Today was my first day back at work, and frying will have to wait.